[. . .] 413+). Far from linking the problems that revolve around diamonds to advertising them and creating greater popularity for the gems, the article rather wanted to determine whether the terrorist group Al Qaeda, for instance, engaged in smuggling arms and diamonds into and out of a failed nation (like Sierra Leone) "anticipate, react to, and adapt to the actions of their foes to disrupt and destroy them" (Milward & Raab 2003, p. 413+). For their study, the authors investigated the parameters of three 'network' operations: heroin trafficking, the Al Qaeda terrorist group, and the smuggling of 'blood diamonds' as currency to buy illegal firearms in failed states of West Africa. This article makes it quite clear that consumer demand for diamonds, fostered by advertising, is probably not the cause of the atrocities surrounding diamonds in West Africa, and not the cause of international strife. They cite "increasing evidence of a close connection between Al Qaeda and the failed states of Liberia, Sierra Leone, and Burkina Faso in West Africa" and note that "The connection appears based on Al Qaeda's need to exchange cash for diamonds" (Milward & Raab 2003, p. 413+). Al Qaeda has been forced to use diamonds to buy arms and other terrorist 'necessities' because the United States and Western Europe have clamped down on Al Qaeda's use of legitimate banks for international monetary transactions. In addition to providing ready currency for Al Qaeda, the same failed states are surmised by the authors to also provide haven for many Al Qaeda operatives because local warlords are willing to offer that in exchange for diamonds, or whatever else diamonds may be traded for by the network (Milward & Raab 2003, p. 413+). The reason for the attractiveness of diamonds to the terrorists and warlords is, however, much the same as the one that makes diamonds attractive to consumers. "Unlike gold or silver, which have fixed values, diamonds are a compact currency" (Milward & Raab 2003, p. 413+) with a fluctuating value, and, moreover, can be carried through airport security without alerting anyone. But their best virtue, and one that is probably not lost on consumers wanting some economic protection should the need arise, is that they are easily exchanged for cash. In fact, because they are so portable and so many were transported, it is a wonder diamonds' value has not decreased. Sierra Leone's rebel leader Foday Sankoh smuggled out tens of millions of dollars worth of stones through Liberia among other nations (Milward & Raab 2003, p. 413+). Charles Taylor, mentioned in the Smillie article, was skilled at laundering RUF diamonds: Under Taylor, Liberia became the place to go to launder money for diamonds (Milward & Raab 2003, p. 413+). The authors cite Smillie, Gberie and Hazleton's 2000 work in which they showed that Taylor not only oversaw trade in weapons for diamonds with the RUF, but did the same for other countries as well. Between 2000 and 2003, Al Qaeda bought diamonds from the Sierra Leone fields at below-market rates and resold them in Europe for millions of dollars in profit. In the summer of 2001, the price Al Qaeda was willing to pay, and the amount of diamonds sought, increased greatly, and also put much of Al Qaeda's wealth beyond the reach of legitimate governments (Milward & Raab 2003, p. 413+). The authors do not make a connection between these diamonds and the consumer market, but clearly, if the diamonds were to be useful to finance terrorism, they had to be sold. Thus, they had to have buyers, and the buyers had to be eager enough to buy diamonds not to inquire too closely as to their provenance. However, Foday Sankoh was captured, along with documents linking Taylor to RUF diamond sales. In addition, there are U.N. economic sanctions against the Liberian government, which the authors conclude has probably reduced the trade in diamonds considerably (Milward & Raab 2003, p. 413+). Otnes, Cele & Linda M. Scott. "Something Old, Something New: Exploring the Interaction between Ritual and Advertising." Journal of Advertising, 25.1, 1996. These researchers investigate areas of advertising specifically related to diamonds that makes it possible to link the demand for diamonds to the illegal trafficking investigated in the two articles above. They note that scholars have argued "that advertising probably influences the ritual behaviors that have recently been shown to order and direct consumption" (Otnes & Scott 1996, 33+). They also note that "De Beers' success at controlling the price of diamonds by limiting worldwide supply is widely recognized, but we suggest De Beers' ability to control supply was also due to its ability to manage demand" (Otnes & Scott 1996, 33+). They did this by positioning the diamond ring as a ritual artifact, at the same time ensuring the many diamonds would be removed from the market as soon as they were purchased, only being returned to the market under extreme circumstances. By linking it firmly with romantic bonds, they also ensured that the only proper way to dispose of a diamond ring would be to bequeath it to a female descendant (Otnes & Scott 1996, 33+). De Beers, the authors not, did not stop there but also instilled norms for the selection of any particular ring, by running advertising informing the consumer that it was necessary not only to consider price but also carat sizes, color, cutting and clarity. De Beers also issued a strategy statement noting that it wanted women to "bond" with others, even celebrity idols, through ownership of a diamond engagement ring (Otnes & Scott 1996, 33+). Perhaps most of all, and the thing that continues to make diamonds so desirable, is that De Beers was successful in helping women link their identity formation to diamonds, allowing only women who received such rings to avoid the alienation and anomie of not receiving one. They have continued in that vein with new advertising that is aimed at making the purchaser feel less worthy if he spends less for the ring than he 'should,' pegged at two-month's salary (Otnes & Scott 1996, 33+). Dubois, Bernard & Paternault, Claire. "Understanding the World of International Luxury Brands: the "Dream Formula." 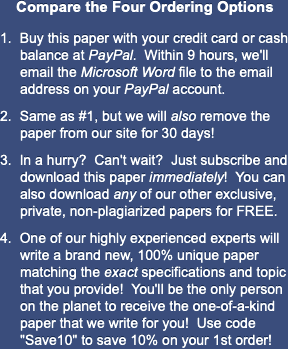 Journal of Advertising Research, 35.4, 1995, 69+. This research was directed more toward helping marketers of luxury goods position their brands. It has little to say regarding diamonds; the diamond industry is, as noted before, monolithic, at least in consumer-oriented respects, and has little to learn from these authors. Also, while a diamond might be considered a luxury object, it is an object even the most modest households will probably own one of, and therefore the insights from this article shed little light on the possibility that the consumer preference for diamonds is responsible for international strife and destruction of lives. The answer to the research question was thought to reside in the literature regarding advertising and the literature regarding diamonds and civil wars, so a literature review was undertaken to determine what factors had already been discovered regarding the research problem. Additionally, in Internet search was undertaken to determine how the diamond industry works. The two categories of information developed through those means were then assessed to develop the findings given below. The Internet search revealed that there are fewer than 200 people or companies in the world authorized to buy diamonds from De Beers, the world's largest diamond cartel, marketing about 70 to 80% of the world's diamonds. Those people and companies are called sightholders. Each sightholder who is allowed to buy a parcel of rough diamonds sends them to cutting facilities and then to distributors. "Diamond Advertising Diamonds." 16 June 2004. Web. 25 April 2019. <https://www.essaytown.com/subjects/paper/diamond-advertising-diamonds/4465248>. "Diamond Advertising Diamonds." Essaytown.com. June 16, 2004. Accessed April 25, 2019.